#EngineeringAtNUVA is a series that highlights talented engineers who make up NuVasive Engineering. Every feature will have a unique set of questions to give you the most diverse knowledge into Engineering at NUVA including roles within Manufacturing, Development, Software, and Electrical Engineering. The series is for students interested in the field, for prospective engineers who want to understand our culture, and for those intrigued to meet some of our incredibly intelligent Shareowners! 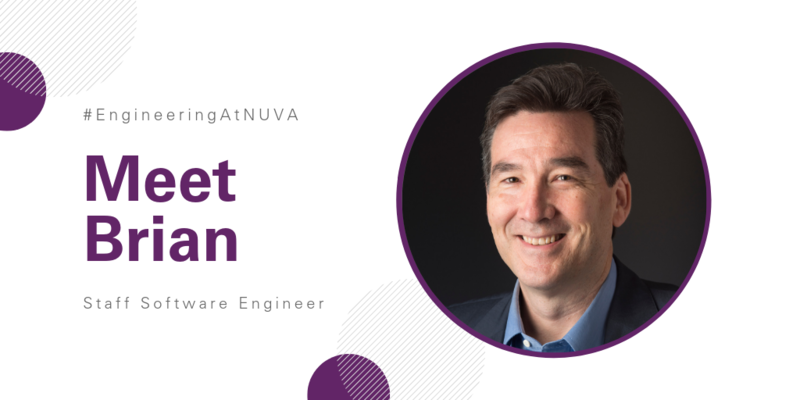 Our next feature for #EngineeringatNUVA is Brian, Staff Software Engineer on the Surgical Intelligence team. Why did you choose to work in Medical Device for Engineering versus other industries? I spent my entire career before NuVasive working in the traditional software space. The opportunity to work on exciting and impactful innovation in the medical device field was intriguing to me and has given me a whole new appreciation for the way technology can be used to improve people’s lives. How long have you been at NUVA? I have been at NUVA since September 2016 working as a Team Lead and then a Software Architect for the Pulse™ platform. Is there a specific class or skill that you wish you took/learned prior to graduating college that would positively impact your work now? Some additional basic human anatomy and physiology classes might have been helpful. The spine class here at NUVA was fascinating to me. It was instrumental in allowing me to pick up the critical domain knowledge necessary for working on a product such as Pulse™. Can you describe your path from realizing you wanted to be an engineer to present day (classes in school, internships, anything that exposed you to engineering)? As a Mathematics major coming out of college, I wasn’t sure how my future would play out. I’ve been fortunate enough to establish a career as a software developer at some terrific companies. NUVA has given me the opportunity to apply those skills in a whole new and more purposeful way. What types of inspiration led you to the Engineering field? A lifelong curiosity about the way things work and a desire to make iterative improvements, no matter how small, to achieve greater efficiency. For those deciding on which type of engineering path to embark on, what would be your best advice (ex: mechanical vs. bio vs. software)? I think individuals need to follow their passion—mine just happened to be software! If you’re about to embark on a long career in a particular area, make sure it’s something you love. What makes Engineering unique at NuVasive in your opinion? The high quality of people across different engineering disciplines here at NuVasive make it a unique experience. Also, the ability to work on groundbreaking technology with a common purpose of improving surgical outcomes. Interested in the engineering field at NuVasive? Learn about open roles and what it takes to be an engineer with NUVA by clicking here.